00:53 | A summit of the Food and Agriculture Organization of the United Nations (FAO) has honoured Princess Maha Chakri Sirindhorn for her role as the UN Special Ambassador for Zero Hunger and for her efforts to end malnutrition and poverty in Thailand and the region. 02:33 | National police chief, Police General Chakthip Chaichinda, has inspected traffic management measures on Sukhumvit Road from Bangkok to Pattaya and the Bangkok motorway, praising police for their work in easing traffic congestion during the Songkran holidays. 03:37 | Deputy national police chief and spokesman of the Royal Thai Police (RTP), Police General Veerachai Songmetta, has reviewed safety programmes to be introduced on Khao San Road and surrounding areas during the Songkran festival. Police General Songmetta said more than 1,000 police will be deployed in the area between noon and 9 pm through to April 15, with metal detectors to be used to ensure no weapons are taken into thoe areas. Up to 30,000 people per day are expected to participate in Songkran activities there. 04:58 | Provinces across Thailand are organising celebrations for the Songkran festival, with revellers dressing in flowered shirts and traditional Thai clothes. Newsline takes a look at celebrations around the country. 09:13 | Dr Jedsada Chokdamrongsuk, permanent secretary of the Ministry of Public Health (MPH), has urged all provincial governors to strictly control alcohol sales and consumption during the Songkran festival to prevent road crashes. Dr Chokdamrongsuk urged authorities to ramp up random alcohol testing of drivers and for all drivers involved in motor vehicle crashes to be tested for alcohol. 10:15 | Thanawat Polwhichai, spokesman for the Government Lottery Office (GLO), said yesterday that 80 million lottery tickets have already been reserved by vendors for sale during the Songkran festival. Predicting sales this year to exceed previous years, Mr Polwhichai attributed the demand to a stronger economy, saying up to 240 million lottery could be required to ensure complete circulation. The winning numbers will be announced on April 16. 13:33 | Prime Minister General Prayut Chan-o-cha yesterday said that the decision to transfer permanent-secretary of the Ministry of Finance (MoF), Somchai Sujjapongse, to a secretary-general position at the Office of the National Economic and Social Development Board (NESDB) was in line with standard procedures. 14:28 | Assistant governor of the Bank of Thailand (BOT), Jaturong Jantarangs, yesterday revealed that the bank will continue to maintain a relaxed monetary policy by maintaining the benchmark interest rate at 1.5 per cent in order to help push the inflation rate up from 0.7 per cent in 2017 to 1.0 per cent this year. Mr Jantarangs predicted Thai exports in 2018 will grow by 7 per cent, a significant increase on the 4 per cent growth estimate made at the end of last year. He also said that he expected tourism, domestic consumption, and private investment will continue to expand throughout the year, though government spending may fall short of expectations due to the new law on state procurement. 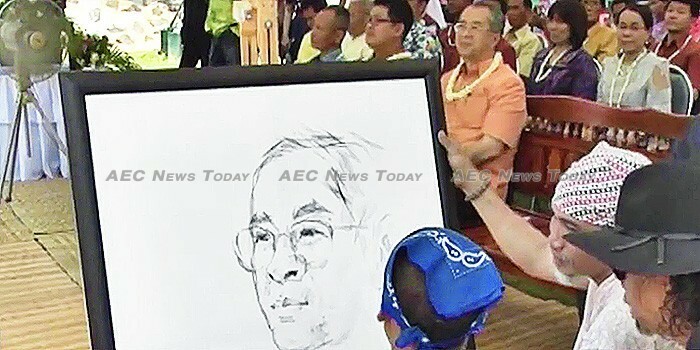 Overall he forecast the Thai economy this year to grow by 4.1 per cent. 16:14 | Secretary-general of the National Broadcasting and Telecommunications Commission (NBTC), Takorn Tantasi, yesterday announced that the 900 and 1800 Mhz frequency concession auctions have been postponed until a new NBTC board is formed. He said that if the 1800 Mhz band auction can be carried out in May or June of this year the process is likely to be completed before current concessions expire on September 15. 17:39 | Local residents yesterday took their pets for free rabies vaccinations at the Phang Nga Municipality. 18:34 | Surin Province has held its annual April Festival in the heart of the Prasat Phanom Rung Historical Park aimed at promoting local heritage. A wide variety of activities are available for visitors, including a painting exhibition, traditional dance performances, a kick-boxing demonstration, and a range of One Tambon One Product (OTOP) goods, in addition to tours of the Prasat Ta Muen Thom ruins. 19:56 | Newsline takes a look at the economic potential of Siem Reap Province, Cambodia. The province is now the second economic hub of Cambodia due to its geographic advantage, in addition to its well developed infrastructure. 22:00 | Two Royal Australian Navy (RAN) ships have docked in the Port of Manila (PoM), Philippines, for a four-day visit to enhance relationships between the two countries. US and Japanese naval vessels are also expected to dock in the Philippines over the next week.